Another Happy Parliafunkadelicment Thangday! I’ve posted Electric Spanking of War Babies (1981) before, but the old link is inactive and I had started writing this post under the impression that I hadn’t yet done it. When I checked again today, I discovered the original post. Plus, I cringed multiple times reading the original post, so I decided to do a rewrite. Anyhow, what’s old is new and what’s new is old, so let’s get on with the show. “The Electric Spanking of War Babies” is a synthed-out effort delivered almost exclusively by Junie Morrison, who was credited for playing the bass, rhythm guitar, keyboards, and drums. Opening with fuzzy guitar and an altered vocal, clearly this is a return to the Funkadelic of old, at least in spirit, after the relative softness of Uncle Jam Wants You. Michael Hampton, my least favorite PFunk guitar player (keep playing those 17 minute long “Maggot Brain” solos), shreds over a vicious groove while the lyrics reference sociopolitical events of the hippie generation. The underneath touch adds so much to the sonic assault and the liquidy synth line starting around the 6:00 minute mark has a unique sound. Electrically charged “Electro-Cuties” has great whispered vocals, bass playing, and Junie provides just enough gritty synth groove to keep things dirty with a little help from the guitar. Cuica makes an appearance on “Funk Gets Stronger (Part I).” More importantly, Roger Troutman breaks his P-Funk cherry while playing rhythm guitar, bass, and moog. Lige Curry, another a new addition, assisted on the low end with some bass of his own. George and Bootsy share vocal duties, although I also think that Sly has a vocal part, but the esteemed Mothership doesn’t have him credited. 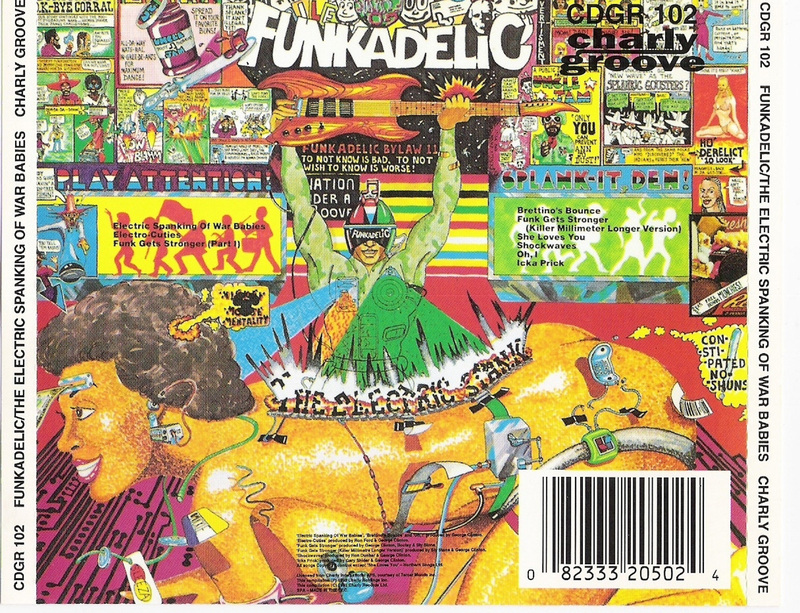 “Funk Gets Stronger (Part I)” is one of the finest Funkadelic songs with the synced up guitars generating a powerful groove. Just before 5 minutes, the groove slow downs as a warm (rhodes?) organ comes in before morphing into a off-kilter closing jam. All in all, the rhythm guitar line provided by Zapp is syrupy sweet and his moog work a tasty treat. Sly Stone pops up, playing keyboards, drums, synth, rhythm guitar and sharing lead vocal duties with GC, on “Funk Gets Stronger (Killer Millimeter Longer Version).” Sly’s hazy warble and George’s rapping style fit together beautifully. Family Stone member Cynthia Robinson, who discovered Dawn Mabry and later got her to join the Family Stone, which is how Dawn met George which lead to her becoming a Bride of Funkenstein, is credited for the trumpet part, which is the same riff heard in Pt. 1. Pat Rizzo, who replaced Family Stone original member Jerry Martini, is credited as the saxophonist. A rare appearance by Eddie Hazel on lead guitar definitely helps make add to early Funkadelic vibe. At the very end of the song, the Beatles’ “She Loves You” is referenced. Great singing carries “Oh, I,” which has some vintage fuzzed-out Funkadelic guitar to go with the soulful vocal arrangement and a jazzy spirit. Ending with an intimate discussion of human sexuality, George dives into something even dirtier than the gutter and Funkadelic’s guitar sound, the human mind. Fuzzed out and grimy, the guitar of the “Icka Pricka” immensely aids GC’s dirty rap and the twisted vocal hooks. Lige Curry delivers the goods on bass, while David Lee Chong is knighted as an official member. Building to a spiritual climax of enlightening obscenity, the demented groove is joined by a choir of angelic voices masks the last of perverse excrement. The keyboard parts work against the guitar lines to help create the demented swing. “Icka Pricka” is gleefully obscene, but due to the lyrical dexterity and the destigmatizing action of the words of the song “Icka” hovers on a sphere high above the sexually explicit, but conceptually empty, gutter trash of today’s pop and club music. Fusing their funky minds with electronic circuits, George’s army, sans Bernie, pulled off one of the funkiest records of the ’80s. George never hesitated about experimenting with new technology. Thus, Electric Spanking utilized both live and electronic drums. It also saw the infusion of new talent Uncle Jam’s Army including Blackbyrd McKnight and Roger Troutman. A perfect demonstration that synthesizers don’t have to mean sterility; that dance music doesn’t have to mean vapid lyrical diarrhea, Electric Spanking is an album that need to be experienced. Sadly, Electric Spanking was last album GC released under the Funkadelic name. Conceived as a double LP, Warner Brothers denied that dream and censored the album artwork. This entry was posted on October 20, 2009 at 9:48 pm and is filed under Funk, Music, P-Funk. You can follow any responses to this entry through the RSS 2.0 feed. You can leave a response, or trackback from your own site. nah, sorry i thought i had it, but i can’t find it anywhere. perhaps, i accidentally deleted it thinking it was a duplicate. if i track it down i’ll let you know. but a search of the internet didn’t reveal anything.